Pay as you go, no need to call or pay in advance! 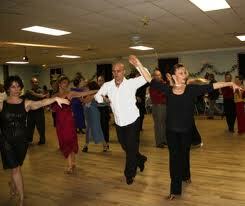 Ballroom, Latin, Wedding Dance, Salsa, Night Club by appointment. Instruction for couples, singles, small groups. Rental space available for dance, vocal, instrumental instructors (hourly floor fees). Call 813-220-1143 for details and/or if you would like to start a class in other dance styles. Rhapsody Ballroom is open to the public for Tampa Bay's best ballroom & Latin dancing every WEDNESDAY NIGHT and FRIDAY NIGHT. Our great disc jockey plays all your favorite dance tunes: swing, salsa, foxtrot, tango and waltz! Come learn the dance steps you see on TV! He will also have mixers throughout the evening, so you don't even need a dance partner! Come enjoy our 2400 sq. ft. floating dance floor, the largest in Tampa! We provide coffee, punch and ice, & we also sell bottled water. Rhapsody Ballroom in Tampa, FL is a NO SMOKING facility. Come join us " FOR THE GOOD TIMES"
NEED DANCE SHOES & love great bargains? Check our ebay store. Learn more about our dance shows.